Cirque du Soleil greeted audiences with a new acrobatic adventure: Totem. The show ran from May to early July 2014, and was a much-anticipated event. Cirque du Soleil knew that their English-speaking fans would be excited to purchase tickets – but what about the Chinese population, a huge demographic in Vancouver representing 19% of the total population? Cirque had not marketed to this audience before, and needed help discovering the best ways to reach them. Their goals were to generate awareness of the show among Chinese speakers, and increase ticket sales from this demographic. That’s where Sheng Li Digital stepped in to help craft a digital marketing campaign. The story of Totem highlights the evolution of mankind, so it was fitting that Cirque was aware of the Galapagos effect: a term borrowed from Darwin to describe how Chinese digital media is segregated online, requiring a completely different skillset in terms of effective marketing. Sheng Li Digital helped evolve Cirque du Soleil’s online efforts, appealing to Chinese speakers using cutting-edge technology and tactics. First, we needed to ensure that all information would be communicated to the new audience effectively. Cirque’s target market consisted of Vancouverites originally from Mainland China, Hong Kong and Taiwan, meaning we needed a content strategy in simplified Chinese characters. 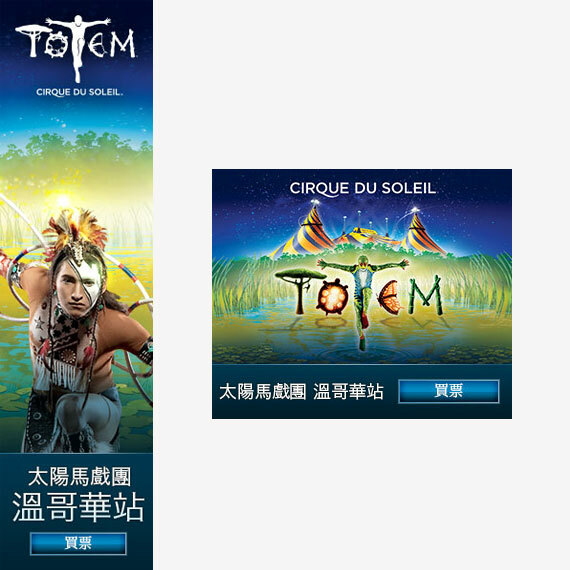 To ensure all marketing drove traffic to a relevant landing page, we created a Chinese landing page containing information about Totem as well as the Cirque du Soleil brand. Information such as email and phone number of the Chinese-speaking agent was added to further facilitate the ticketing process. After this infrastructure was in place, we began evolving a full-scale digital strategy. Here are some of the tactics we employed and their results. Enjoy. One of the best ways to gain exposure for an event in the entertainment industry is a good old-fashioned online contest. We ran a contest on Weibo (China’s version of Twitter) from June 5-23rd, with a grand prize of 5 pairs of tickets to see Totem. 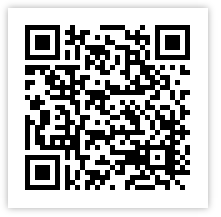 Contestants needed to follow the Weibo account, repost a Totem-specific post, and use the contest hashtag to enter. Sheng Li engaged with local Weibo influencers to promote the contest, and it received over 200 entries in its first hour – but more on these stellar results later. 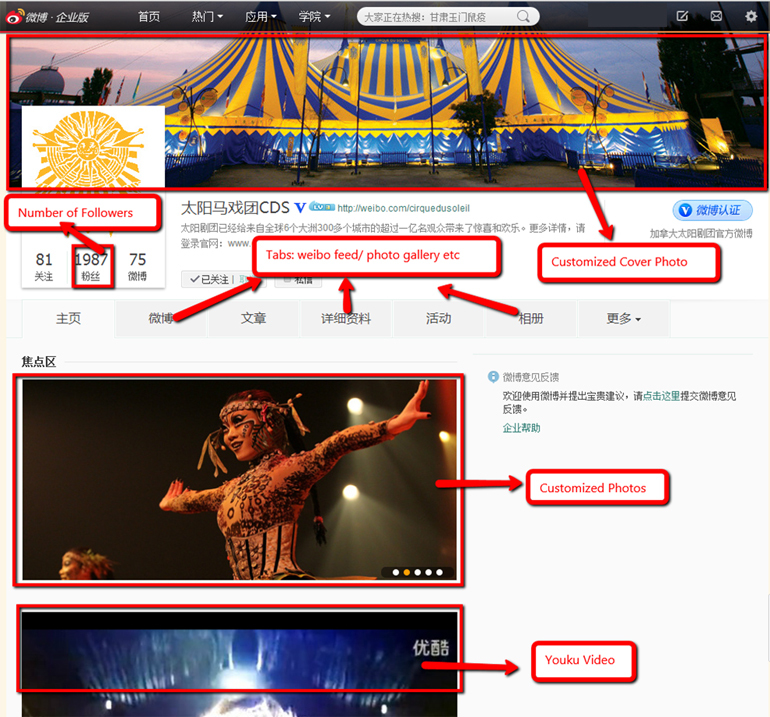 In preparation for the contest, Sheng Li optimized Cirque du Soleil’s official Weibo account with an updated cover photo, new focus photos, and a focus video for Totem. In addition, we were able to secure a name change for the verified account from “Theatrical Company of the Sun” to “Circus of the Sun.” Nothing lost in translation here. Weibo’s conversion rate was very high at 8.9% and the average order value was the second highest of the campaign. On behalf of Cirque, Sheng Li made 40 posts to their Weibo account, and over the duration of the campaign gained 550 followers. On average, each post had over 7,700 impressions, 3.6 likes, 6.2 shares and 2 comments. In total the contest received 773 entries. We encouraged brand awareness and drove traffic back to the Chinese landing page with Facebook CPC ads. Wherever a user went, the ads were accessible — they ran in the newsfeed, mobile newsfeed, and right hand sidebar, encouraging interaction on mobile devices as well as desktops. Sheng Li was able to target 68,000 Chinese-speaking Facebook users within the GVRD. Facebook ads drove the most traffic to the landing page with 3,516 visits, and generated the second highest number of ticket sales. The conversion rate of the Facebook campaign was 3.36% and the ROAS (return on ad spend) was 4.32. 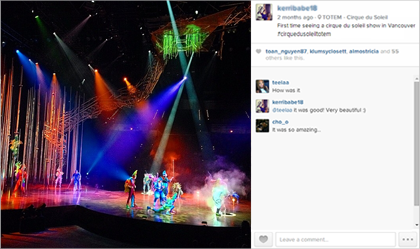 For every dollar spent in Facebook, Cirque generated $4.32 in online ticket sales revenue. We launched a media buying campaign that utilized 2,500 Chinese websites on the Google Display Network (GDN) to create awareness and increase buzz around Totem. The reach of these ads spanned desktop, mobile and tablet devices, and they were able to target potential customers by age, geo-location and language. We also purchased prominent ad real estate on key websites that had a relevant reader base and negotiated direct media buys. This included sites such as vandiary.com, vanpeople.com, and westca.com, reaching more than 300,000 highly localized Chinese media consumers. The direct media buys contributed to a conversion rate of 3.27% and a ROAS of 4.5. It was time to capitalize on all the users eagerly searching for “things to do in Vancouver” in Chinese. In Google, we targeted people actively searching for ‘Vancouver events’-related terms, as well as branded Chinese keywords. This ensured Totem would be top-of-mind whenever people expressed an interest in getting out on the town. The search engine marketing (SEM) campaign was the most effective and cost efficient at driving online ticket sales and revenue. The search campaign generated 524 ticket sales and the conversion rate was 30% with the ROAS at a whopping 255. This is the highest ROAS of any campaign that we have ever run in the 5+ years we have been running Chinese focused digital marketing campaigns. 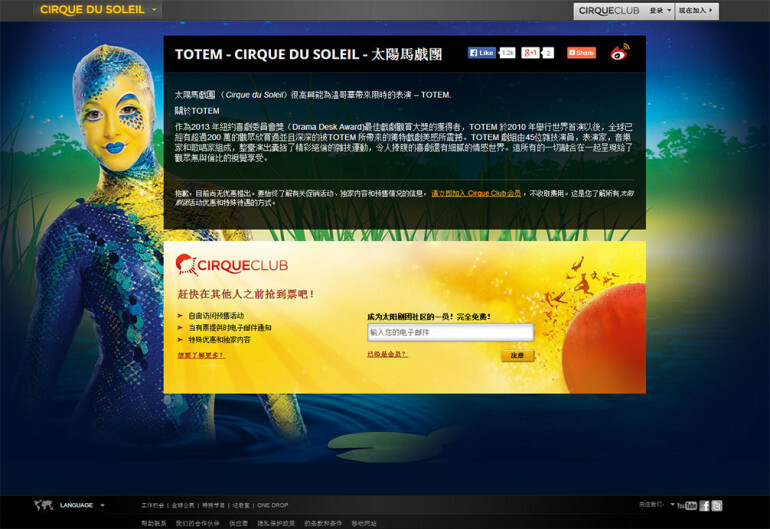 The majority of the traffic and sales resulted from branded searches for the Cirque du Soleil brand name in Chinese. While this may seem logical, it was a major discovery to discover that potential customers were searching for “Circus of the Sun” in Chinese and were not able to find the show in their local city. As expected, the search volume for Chinese keywords was lower to start with but increased as awareness generated from the other channels increased, as did the demand. To reinforce the allure of the show and give users a stronger call-to-action to purchase tickets, we used remarketing to target individuals who had visited the Chinese landing page but hadn’t bought tickets. Traffic for the remarketing campaign started gaining momentum in the first week of the campaign. However, the number of tickets sold through the remarketing campaign was the highest towards the beginning of the campaign, but flattened off towards the middle and end as tickets sold out. The remarketing campaign drove 1,413 visits to the landing page with a conversion rate 2.9% and a ROAS of 3.56. 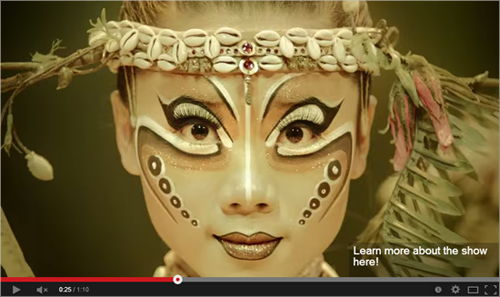 A YouTube CPV campaign was utilized in the first two weeks of Cirque du Soleil’s campaign to generate awareness. A trailer video promoting Totem ran at the beginning of videos which were determined to be of most interest to Chinese-speaking Vancouverites. The Totem trailer received nearly 500,000 impressions on YouTube and 10,000 views at an average cost-per-view (CPV) of $0.06. The focus for the YouTube campaign was more about branding than a direct response channel. Sheng Li invited local Weibo influencers to attend a performance of Totem, complete with a backstage tour where they met some of the Chinese performers including a frog and unicyclist. The influencers shared their experiences, photos and highlights on social media, gaining more exposure for Cirque du Soleil and sending viewers to the Chinese-specific landing page. 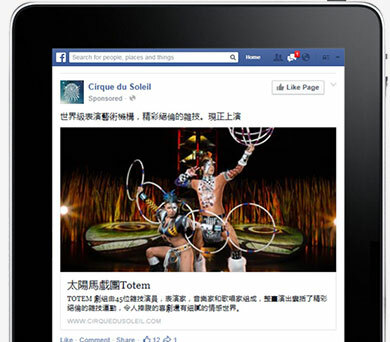 The majority of traffic and sales resulted from branded searches for the Cirque du Soleil name in Chinese. As expected, the search volume for Chinese keywords was lower at the start of the campaign and then increased as awareness increased. It’s important to note that the tactics that we employed were because our target market was Chinese-speaking individuals in North America, and more specifically Vancouver. Had we been targeting people from Hong Kong or Mainland China, our tactics and channels would have been similar but at the same time completely different. Overall, the campaign drove 16,000+ visits to the website and there were 1,000+ tickets sold online, with an online conversion rate of 6.2%. An additional 250+ tickets were sold over the phone and are not reflected in the conversion rates in this case study, making overall conversion rates actually 25% higher. The overall ROAS of the campaign, factoring in Sheng Li Digital fees and phone orders, was greater than 10x. Now that’s ROI you can bank on.